The scroller idea is inherently simple. Simple machines are inherently reliable. But, you say, the execution is not so simple, how do you make them reliable? We started nearly 30 years ago in our quest to make scrollers. We are now in our 3rd iteration of our 3rd generation scroller. During the 30 years we have made mistakes, and fixed them, and made changes and enjoyed the improvements. It is difficult to count the tests and reliability runs that we have done. Once we were tracking a bug that only showed up after 6 weeks of continuous running. After 6 weeks, when it showed up, we tried a fix. It took several 6 week periods, but we got it. After tens of thousands of scrollers delivered to all parts of the world for all kinds of uses we have learned a lot about making the simple scroller. And today we still learn things about how to make them better. All of the professional grade units that we make are burned in for a minimum of 24 hours. Each unit is fully monitored during that time so we know that it had exactly zero problems during it's burn in. The ones that had a problem, we dis-assemble the unit and fix the problem and then burn it in again for 24 hours. All the problems that we learn about are documented and if they appear enough times, we start a project to identify the cause and then make an engineering change to eliminate that problem. Even with continuous improvement, we change models slowly. The benefit to you is the product is built for a long period of time so if you need to add on to your system, they are probably still being made. Also, if we don't make it any longer, there are lots of units in the field and it is easy to find units that are available and can refurbished by us to give you a nearly new warranty. The previous iteration of the Coloram series, Coloram II was manufactured for almost 20 years, so there are lots of our dealers who are able to maintain them. Like all of our products, we will support these for 10 years after they reach the end of production. The only exception to that is if we can't get purchased parts because they have gone out of production. We have purchased the end runs of several electronic parts so we would have stock as long as possible. However, even we have limits. 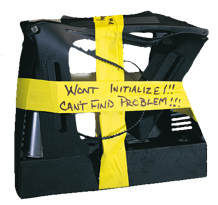 We keep this Coloram II around because we appreciate the humor the customer showed when they dropped this color changer off a truss. We do our best to make our products strong, but a 20 foot fall to the stage floor is beyond what these are capable of. We do think we could make them strong enough to fall that far, but we don't think you want the extra weight. When accidents do happen we are here to fix what you broke, or in this case, sell you a new one. For the record, the munched Coloram II came from Obie's Lighting Productions. We have another interesting story about Obie: He was our first customer. About 15 years ago when we wanted to get Serial #1 back from him, we made the offer, "send 6 Colormaxes back and we'll send you 6 new Coloram IIs." Well, he sent back 16! But the best part was that 14 of them still worked. We got Serial #1 back and sent the rest of the 15 year old Colormaxes to a club in Rochester, MN where we think they are still working today. Keep watching this space and we'll try to get a picture of 30 year old #1, the scroller that started it all.